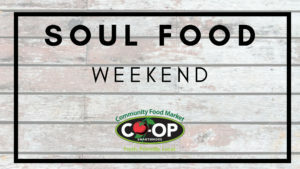 Stop by the CO-OP on Saturday, February 16th or Sunday, February 17th for Soul Food Weekend Hot Bar. Menu Includes: Fried Cabbage, Baked Mac n Cheese, Fried & Baked Chicken, Collard Greens, Corn on the Cob, Fried Fish. See you then!